Do you know when to turn to an engineering company for larger community development projects or when fixing retaining wall failures? Kevin R. Giles, RS explains when it may be best to turn to a professional engineering firm for help. Mr. Giles of Criterium-Giles Engineers has performed numerous reserve studies for a wide range of community associations throughout North Carolina, South Carolina and Virginia. Mr. Giles has also achieved the CAI designation of Reserve Specialist (RS). Criterium-Giles Engineers works with hundreds of associations each year on reserve studies, transition studies, construction administration and other engineering consulting projects. Q: Why do some larger projects require an engineering company to create designs when community development is needed? A: Building inspection/permitting departments will typically require professional engineering design for certain projects including retaining walls, structural/foundation repairs, etc. For larger scale community development projects ($100,000+), many of our association clients find great value in construction administration services. These services can include developing a scope of work/project specifications as well as a request for proposal (RFP), soliciting and reviewing bids from suitable contractors, and providing quality assurance inspections during the project. Hiring an independent professional to assist with community projects can greatly improve a Board of Director’s confidence in decision making during the project. The independent engineering management professional can provide an unbiased scope of work for a request for proposal (RFP), ensure contractor bids are based on the same quality/quantity of materials, explain variances in bids and provide reassurance that the work being performed is in accordance with the scope of work. 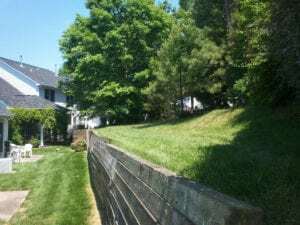 Q: What are some typical signs to look for in a retaining wall that may be failing? What type of preventative measures can be done before it reaches that point of failure? 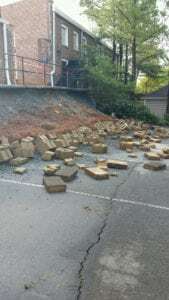 A: Symptoms of retaining wall failure include cracking in concrete/block members, gaps developing between blocks, leaning, bowing, shifting, and deterioration in wood timber members. 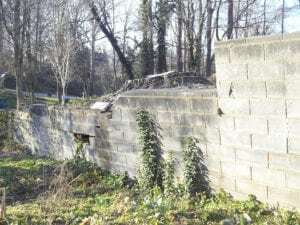 Drainage concerns above a retaining wall can result in increased hydrostatic pressure behind the wall which may lead to premature failure. 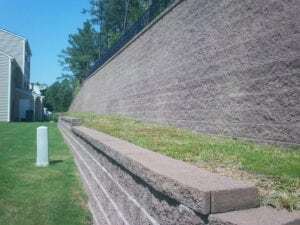 Maintaining free flowing drainage systems above the wall will help prolong the life of the retaining wall. 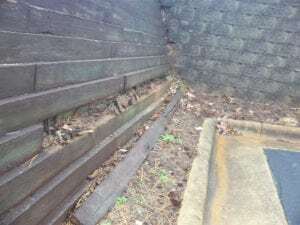 Depending on the type of the retaining wall, there may be a French-drain type system installed behind the wall with outlet pipes through or adjacent to the end of the walls. 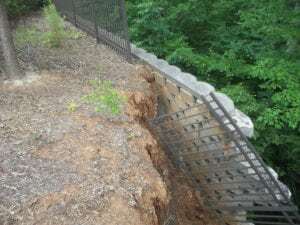 Additionally, large tree root systems above a retaining wall can have a similar impact. We would recommend consulting with an arborist prior to installing trees near a retaining wall as a part of the community planning process.